Adoptable canines help dispel the rumors behind spay and neuter, in this 12″ square wall calendar for 2015, featuring the dramatic photography of Samara Iodice, from See Spot Pose. Each year, in the U.S. alone, 3 to 4 million dogs and cats are euthanized because of pet overpopulation. However, a simple solution exists that could prevent this tragedy – spay and neuter. The goal of this dog calendar is to educate and spread the word about spay and neuter – and debunk the rumors that keep so many pet owners from doing the right thing. The calendar is only $15 and 100 PERCENT of that goes to support the care of rescue dogs from the Canine Adoption and Rescue League. 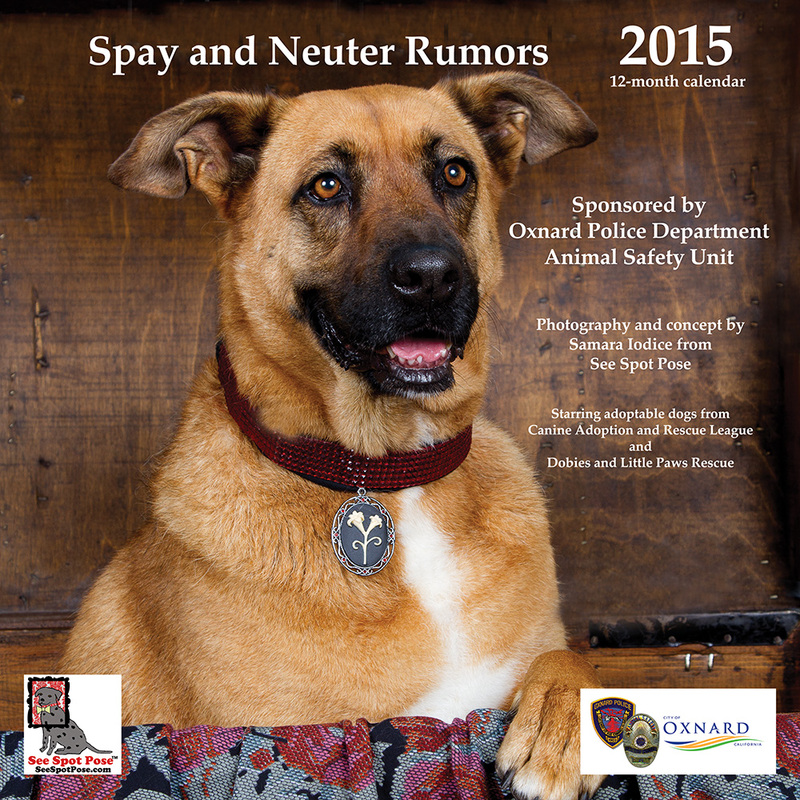 This year’s calendar was sponsored by the City of Oxnard, Police Department, Animal Safety Unit in support of their community spay and neuter education program. In addition, a limited number of calendars are being offered for sale for non-profit purposes only – to help the rescue dogs. The calendar is 12″ x 12″ and includes traditional holidays, pet-related observances, and moon phases. Ships starting December 5th, 2014.